Making its European debut at IFA 2018, the Nanoleaf Canvas is here to change the way you think about lighting. With its intuitive touch controls and modular square design, the Nanoleaf Canvas transforms everyday lighting into an experience curated just for you. It’s the middle of winter, but you wake up to a beautiful sunrise painted by the Nanoleaf Canvas. You get out of bed and walk to the bathroom while brushing your hand across the wall. A soft ripple runs across the orange yellow glow of your Canvas wall, bringing your space to life just as the sun rises outside your window. With the Canvas, you create your own personal lighting masterpiece. Tired of toggling between 10 different apps just to control your “smart” home? The Bluetooth-enabled Nanoleaf Remote is a sleek new addition to your smart home that lets you fully customize your entire home with a quick turn of the wrist. 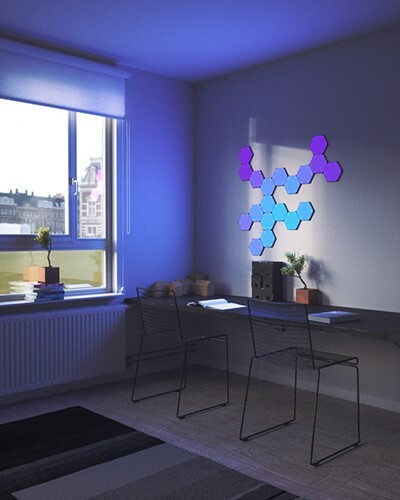 This 12-sided Apple HomeKit-enabled Remote makes you the master of your domain – along with the best-selling Nanoleaf Light Panels, control all of your 3rd party HomeKit products at once. Turn on the lights, lift your blinds, and increase the temperature a notch by triggering different pre-set Scenes. With the Remote in the palm of your hand, you are in complete command of your space. Set a different Scene for each face of the Remote with the Nanoleaf Smarter Series App. Set “party time” to activate a psychedelic Rhythm Scene for your next bash, or “getting cozy” for the Fireplace Scene when you’re winding down for the day. With the Remote, you control the HomeKit Scenes that fit into your life. Nanoleaf will also be unveiling their brand new line of shapes planned for release in 2018.